I went on a business trip to Seattle with several colleagues. At the airport in San Diego, one of them mentioned he had just finished a book he really liked: The Martian – by Andy Weir. It was about an astronaut stranded on Mars by himself, and his fight to survive. I downloaded the book before I boarded the plane and started reading it on the way. I was in Washington for 3 nights. During the days I worked, and at night I read the book. I finished it on the plane back. I could not put this book down. Mark Watney is one of a crew of six astronauts on a mission to Mars. They are planning on staying for a month. On the sixth day on the planet, a severe storm hits and they are forced to abort the mission and leave in an emergency takeoff. On the way to the ship, Mark gets injured by a flying antenna that punctures his space suit. The bio computer indicates flatlines. His crew mates think him dead and leave in a hurry because they are worried that the ship will be toppled. But Mark is not dead. When he comes to and assesses the situation, he realizes that nobody knows he is alive, he has no way of communicating with Earth, the next mission to Mars, to a completely different location, is not scheduled for several years, even a rescue mission would take a year to reach him, if there could be one, and the habitat has food and supplies for six people for one month, or enough for one person for six months – not enough for him to survive. But Mark is an astronaut, and he is resourceful. In MacGyver style he removes the antenna that has impaled him, and he realizes that he was lucky not to be injured seriously. Then he gets to work on a plan of survival. The story switches between Mark’s log files as he tells the story, and the NASA team that tries to rescue him, as well as his crew mates on their way home. The action never stops. This is an extremely technical novel. If you love stories about space travel, NASA, exploration and human ingenuity under extreme conditions, like I do, this is an amazingly entertaining and riveting story. If you don’t have an interest in learning what happens when a human breathes in oxygen and exhales carbon dioxide in a closed environment, then this might be over your head and possibly even boring. For the techies among us, this is an absolute must read. As I said, I could not put this book down. 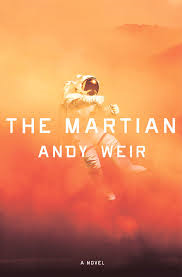 I learned that there is a movie on the way – with Matt Damon playing Mark Watney. I can’t wait. I would never have found this book, hadn’t its author posted a critical comment on my book review for Voyage by Stephen Baxter. I had too many other books to read and simply didn’t feel like finishing. David Hardy admonished me that I should not be reviewing a book I had not finished. That got my attention and I followed the author to his website and found that he was a famous science fiction artist and writer. Voyage by Baxter is a story about alternate history, where humanity didn’t stop interplanetary travel after visiting the moon, but went on to Mars. 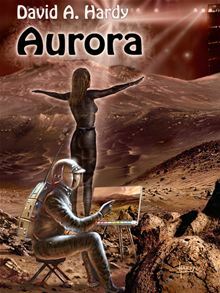 Aurora by David Hardy deals with similar subject matter, and much of the action in the novel takes place on Mars. I can see why he found my post about Voyage. In Aurora, a group of six astronaut scientists land on Mars with the objective of searching for traces of life. When they go about their business they are more successful than they could possibly have dreamt, as they find much more than traces. They uncover actual technological artifacts, apparently still in working order, and what looks like a flying saucer. The longer they look, the more surprises they find, and very soon they and all the scientists back on Earth at Mission Control are completely baffled. Nothing seems to make sense. Aurora is an intricately designed story with a complex plot. I found the first ten percent of the book somewhat confusing. I didn’t quite get engaged. Fortunately, the author’s words rang in my head, ordering me to stick with it, and I did. The pace picked up tremendously when the action on Mars started unfolding. Gradually the story pulled me in and I started turning the pages. It felt almost like the book took off the training wheels at that point and the action moved right along. The suspense in this novel didn’t come from danger to the protagonists, but from wanting to get answers to the impossible situation the astronauts encountered. Anybody interested in interplanetary travel stories in the near future, as well as pseudo scientific topics like UFOs, dousing, extrasensory perception and telepathy, would certainly enjoy Aurora. The concepts the author introduces are thought-provoking. There is even an element of time travel involved, my all-time favorite science fiction topic. This book packs it all in. In the end, I will never think of Mars in quite the same way again. When I was finally done reading, and the storyline had closed in on itself, I had the urge to go back and read the beginning again. Now it made sense. I have done that with other books occasionally. Here it did the trick. It all came together nicely. Aurora is a fresh and unique story about aliens that are not so alien at all.